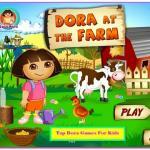 Dora Celebrate Thanksgiving is an Action game on Friv4. Thanksgiving Day is coming! 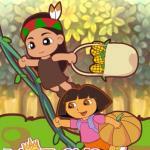 Dora Celebrate Thanksgiving: In this new game with Dora she will go in a fantastic adventure with a new friend of hers, an Indian girl. The game is played in two players, and one controls the Dora, the girl and the other Indian. You have to go with the two and squeeze all the maize, and when finished you will encounter along the border to go to the next level. Dora Dentist: Dora loves sweets and now she haves teeth problems. You are going to be the friendly dentist that will handle Dora's appointment. 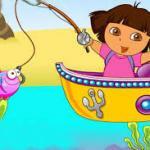 Dora Fishing: Come with cute Dora and get more realistic fishing experience. It looks easy but it's hard to pass all the levels. Have fun! Dora Differences: Find the Differences you need to keep locate differences between the two pictures in the limited amount of time given to play each time! 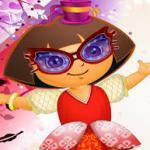 Dora in Ever After High Costumes: Hi Kids, Do you know what the Dore the Explorer explored today? She explores the costumes of Ever After High. 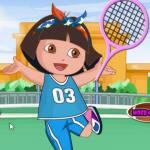 A few days ago, while playing the games for girls online, boots narrated the story of Ever After High to Dora. 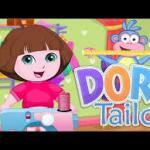 Dora Washing Dresses: Dora Washing Dresses is new fun game for little girls. 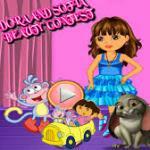 In this awesome game, cute little Dora has a lot of dirty clothes.